Don’t Really Like the Elevated Dog Food Bowls? Try These 5 Alternatives! Some people don’t really like the elevated dog food bowls due to some reasons; bloat issue, price and so on. However, you still have some choices if you are looking for the unique items for the little puppies. The basic dog feeders are often used for the elevated dog food bowls which are effective. It is typically made of plastic, ceramic or stainless steel. It comes with a wide range of colors and styles besides the custom made. The ceramic dog bowls are highly suggested if you want your pups to eat nicely. The ceramic bowl is a great choice for your pet which is less harmful because the bowl will not contaminate the food. Besides, it comes in wide range design and colors. Due to the heavy duty, it is difficult for your dog to flip over the bowl. If you think your dog is difficult to reach the food when it is placed on the floor, try to put it on a higher place. You can use the bucket if you don’t like the elevated dog food bowls due to its design danger your pet. Sometimes, the pups like to play the stand, so it traps the accessories sometimes. The slow feeder dog bowl is also a good pet dish to help you train your dog eating slower. Most dogs, especially the larger ones always eat the food faster. This will lead to suffering from bloat that put your pup in a big risk. 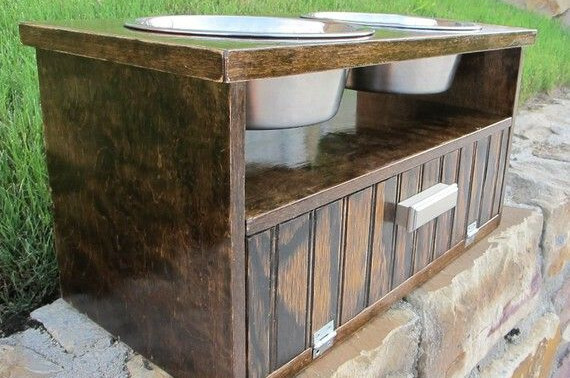 The slow feeder dog bowls typically come with barriers as a challenge for the pets during eating. However, you still should be careful because not all dogs will like it very much. Opt for the simple design, for example, the one with a single barrier or some simple barriers. The complicated barriers will make the dog be stressful and flip the bowl instead of reaching the food. Some pet owners are really busy and they forget to feed the dog at times. The automatic food dispenser is an alternative you can try. It typically comes with reservoir or container to store more food. There are many of them come with the automatic setting so when the reservoir is empty, the dispenser will automatically fill it. You can set the time as your dog meal time. Thus, there is no worry about obesity due to this case. Another type of dog bowls you should have is the portable dog bowls. Instead of the elevated dog food bowls, the travel dog bowls are very effective and flexible. You can bring it anywhere you want without eating the space of your travel bag. If it is a larger breed, place it in the bucket with an appropriate height. Somehow, you will deal with the bowl size since most travel dog bowl comes in a smaller size than the regular. Overall, this is one of the best options you can pick, especially if you love traveling. ← Do the Dog Feeding Bowls On Stand Really Helpful?